Black Horse with his wife and child at Fort Marion, Florida. The Buffalo Hunters' War, or the Staked Plains War, occurred in 1877. 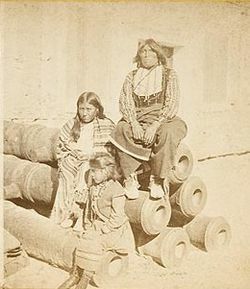 Approximately 170 Comanche warriors and their families led by Black Horse left the Indian Territory in December, 1876, for the Llano Estacado of Texas. In February, 1877, they, and their Apache allies, began attacking buffalo hunters' camps in the Red River country of the Texas Panhandle, killing or wounding several. They also stole horses from the camp of Pat Garrett. Forty-five hunters, led by Hank Campbell, Jim Smith, and Joe Freed, and guided by Jose Tafoya, left Rath City, a trading post on the Double Mountain Fork Brazos River. Smoky Hill Thompson remained behind to lead the defense of the trading post. The party trailed the natives to their camp in Thompson's Canyon, now known as Yellow House Canyon in present-day Lubbock, Texas, where they attacked on March 18. The hunters were repulsed and the natives escaped, including white captive Herman Lehmann, who was wounded in the battle. Among the hunters were four wounded and one later dying from wounds. The native's loss was later reported by the military to be thirty-five dead and twenty-two wounded. This was one of the last armed conflicts with Comanche warriors. The Buffalo Soldier tragedy of 1877 also known as the "Staked Plains Horror" would follow this Buffalo Hunters war in July 1877.